Puma has enlisted the help of Gru's Minions to help design an upcoming collection. 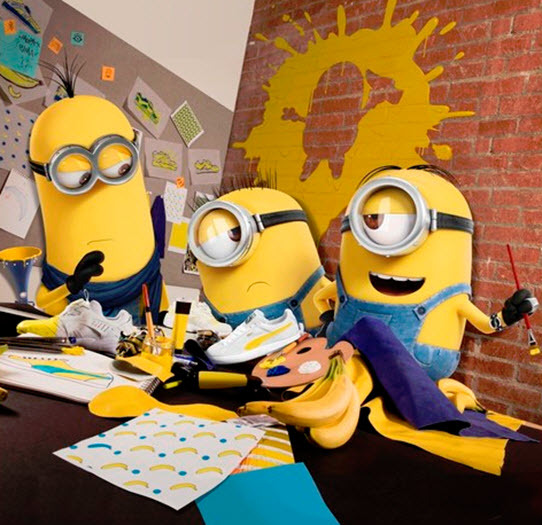 The Minions will be the latest Creative Collaborators for Puma. The Fall-Winter 2017 collection will tie-in with the upcoming film, Despicable Me 3. Heiko Desens, Puma Creative Director for Sportstyle, says in a statement, "We're very excited to have partnered with the Minions for a collaborative collection. Their mischievous and playful nature fits the Puma DNA to a T. Apart from their zest for life and endearing character, they inspire us in many ways; they're extremely hardworking and passionately creative. We welcome the Minions to the Puma Family." The Puma collection the Minions are working on will be part of the Puma Fall-Winter collection. Stuart, Carl and Kevin have created a new pattern with splashes of color, goggles and more. The footwear will feature custom Minions-painted graphic insoles that are finished by a debossed collaboration logo. The Minions usually work for evil masters. They are hard workers but they can be clumsy and often produce hilarious results. Puma will need to supervise their new collaborators. The Puma x Minions collection will arrive globally on June 1st. The new film, Despicable Me 3, will arrive in theaters on June 30.